3 Or 5 reasons why you will want to run the 305 Half Marathon on March 4th! Disclaimer: I’m promoting the 305 Half Marathon as part of being a BibRave Pro. Learn more about becoming a BibRave Pro (ambassador), and check out BibRave.com to review find and write race reviews! 2. Cafecitos will be provided on race day! A very typical Miami morning beverage to help wake you up. 3. iRun pacers, the best pacers in Miami! 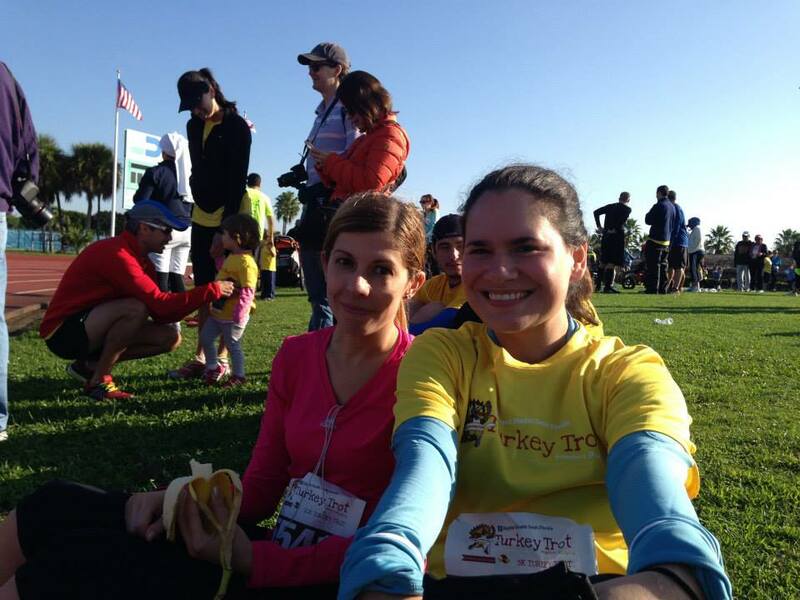 The iRun Army will get you to the finish line in exactly the time you need/want! If you need a pacer, they will have about 11 pacers available for this race according the to RunMiami facebook video. 1. 305 Drive Ignited by Athlinks – a 400-meter speed challenge within the half marathon course starting at mile 3.05. Earn a cool 305 Drive hat for all 1st in AG winners! 2. Eppa Sangria SupraFruta Bar, refreshing sangria post race, yum! Awesome upgrade from the typical post race Michelob Ultra beer from the past, don’t worry if you’re into beer, it will be available too! 3. Frankie Ruiz, Baptist Health Run Club leader/Miami Marathon co-founder will be celebrating his upcoming nuptials with his lovely bride to be, Carla Duenas by running the race and partying post race with all their run club/running family. 4. Miami inspired post race food like pastelitos and croquetas. 5. Complimentary (FREE!) race photos courtesy of Athlinks! If you don’t already use Athlinks, check it out now and find and claim all of your past race results! Add race rivals and friends and find out about the hottest local races around. If you need anymore reasons, here’s a bonus one: Register and use the code “BIBRAVEMB18” which gives $5 off! Disclaimer: I’m promoting Palm Beaches Marathon & Half as part of being a BibRave Pro. Learn more about becoming a BibRave Pro (ambassador), and check out BibRave.com to review find and write race reviews! I signed up a year ago after it was announced that the 2016 race would not be held but that they were under new management and offering a low race price and free in training shirt for signing up for this new Palm Beaches marathon & half. At that time I booked a host hotel and planned on spending the Saturday in the Palm Beaches before the race. A week ago I traveled to the Space Coast Half marathon and decided against staying overnight at another hotel. No other reason really than just getting to sleep in my own bed the night before a half marathon. I knew going into this that I would be forced to drive up the day before to pick up my packet. I guess that is one way to get the surrounding county residents to stay in the palm beaches for the weekend but it was just not really possible this year. Maybe next year if I do the race again. Anyways onward to the packet pick up stuff, it was held in a small building in a big mall like complex known as City Place in the downtown WPB area. Parking in a nearby parking garage was a breeze and parking was free for the first 60 minutes which is another plus that I wish most races would have. I didn’t plan on spending more than maybe 30-45 minutes to pick up the race packet so I could get home and get some other Saturday morning errands done. Found some signs pointing to where packet pickup was and followed some runners (their shoe choices are usually a dead giveaway!). Also had my toddler in tow so we werent quite as fast as normal but still did not take long to get my race bib and race shirt. Probably about 5-8 minutes, no line to pick up my bib and then went into this rotunda area where we picked up gear check bag and then the race shirt in another area. The full marathoners had an option of short sleeve or long sleeve shirt, which I thought was pretty cool. Not that this race ever gets chilly enough to require a long sleeve shirt afterwards but still nice for training purposes in the winter months. Half marathoners get an orange shirt and the full marathoners got a royal blue shirt. In the past some of the shirts I have gotten for this race are nice and some kind of boring, this one leans towards maybe not so interesting. So we walked around a bit and looked at some of the booths but this expo was tiny compared to the ones I am used to from Miami Marathon and even Space Coast Marathon had a larger expo with more to see. Maybe since it’s the first year for this crew they are just getting started and didn’t have as much experience in race expo stuff. They had a good variety of race branded gear from what I saw but I rarely purchase race shirts at expos. During the race though I saw a lot of those shirts being worn so must’ve been pretty good quality for running in. Right before I left I asked one of the official pacers to take my pic with my toddler in front of the official backdrop, he saw my Volee shirt and said “Oh Oiselle girls, head up wings out!” so he was definitely familiar with Oiselle! Now for race morning, I woke up super early at 2:45am in order to be ready to leave my house by 3:30am for the drive up to West Palm. I took the Florida Turnpike and was able to get a prime parking spot very close to the starting line by 5:15 am, which is perfect because I love being at races at least an hour early. It took me 3 minutes to walk over to the port a potty area, I brought some Starbucks napkins with me anticipating no toilet paper but I guess I was early enough to get to be the first user of the port a potty! Hooray, it was almost like breaking the tape in a race, being able to unwrap the toilet paper for the first time in a port a potty. I have never done that before! And every runner knows that its hell to have to use a port a potty after 50 other people have used it, ICK! Just my luck as soon as I left the port a potty area I walked by a regular running water bathroom, FACEPALM! Yeah so I kept that bathroom in mind later on when the race was getting close to start time to get in a last minute pee, of course at that time the toilet paper was in low supply and the line was long but still less stinky and dark than those port a potties. I met up with an Oiselle Volee teammate, Amy right before and we walked over to the start/finish line. In the past for this race the starting line was a bit farther down the street but this time it was the same as the finish line so that was something different but convenient for me. At the finish line I grabbed a cold (YAY!) bottle of water and my medal. They were also giving out mini towels so I grabbed one to wipe away a little bit (no, really A LOT) of sweat before heading to the food tent. It was a small tent but the line moved quickly for the most part and they had a pretty good selection of food, the typical bananas and bagels but also pancakes/waffles/sausage options also. Oh and how can I forget, mimosas!! I definitely drank one of those down, probably a bit too fast but the orange juice actually tasted great after that long hot run and I’m sure the champagne helped a bit too! I grabbed a granola bar and went to congratulate the top 2 ladies on their awesome half marathon finish. Then I hit the bathroom for one last pee stop before heading back on the long trek home. Personally I think I should’ve stayed overnight in Palm Beach for a little less driving and a lot more relaxing. Maybe next year? This is the 4th time I have done this race and the 3rd time doing the 10k distance. Last year I was only a couple months postpartum so I ran the 5k to keep it easy. I set my sights on a faster 10k this year and a day after my fastest stroller 5k, kind of a lofty goal. Finish time: 51:32. Officially my fastest stroller 10k! Two new distance PRs back to back! The morning started off cool but sprinkling, when I left my house the rain was coming down pretty hard. The weather luckily cooperated and stopped raining but the temps stayed cooler for a little while during the race. Before the race I had to use the bathroom so it was Phoebe’s first time in a portapotty. ICK. I made her face me the whole time and not touch anything in there while I peed, definitely an experience with a toddler but with no one to watch her it had to be done. The race started on time and we were off for our two loop course that passed by an early voting location with a few news crews interviewing people. I didn’t feel like I was really pushing myself during this race, like it felt pretty effortless and was able to cheer on friends through the course. At the end of the race I was even able to pass a guy going at a hyper speed with the stroller. I apologized as I passed him quickly. After the race I got to try some juices and grabbed a slice of watermelon. Hung out with some other runner moms and then headed home. Again 4th place in my age group, by seconds!!! One day I will break into the 3rd place, one day! Again another lovely race with some awesome iRun-ners and great race organization. I will do this race every year as long as I am able, hopefully that’s a very long time. I did the 5k race last year as my first timed race and this year I decided to do the 10k. There really is not enough 10k races in the Miami area, I hope this changes sometime but I do not see it happening anytime soon. 10k is really my favorite distance. For this race I didn’t want to kill myself for a good time really but rather use this as a warmup for my iRun 10k happening 3 days later. Funnily enough the iRun running group were the pacers for this race so I ran with the 54 minute 10k girl. This race started at 7:30am, I always prefer much earlier or at least 7am races but the weather was great for running that morning. Around 55 degrees or so, I wore a lightweight long sleeve and capris, lots of others were wearing full length tights and hats, I knew they would be regretting that decision pretty early. Because seriously in Miami we never really see these kind of temps, sometimes in the coldest months January & February but otherwise its always hot. Plus this race is a big family race so there’s a lot of strollers and families running/walking together. 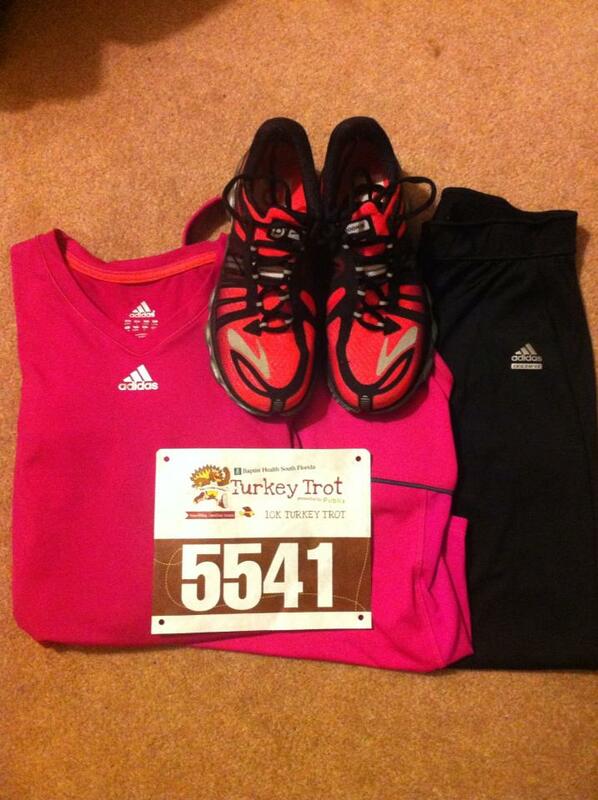 This race was dedicated to my friend Tony, who does not eat turkey on Thanksgiving either. my great finish line photo. major fail race photographers! It was a lot of fun doing the 10k distance this year and running through a neighborhood and talking with the runners who were also running with the pacer. Still had my headphones in case I got bored and needed some music. The last mile I took off and left the pacer and rest of the group behind, thanking them. Unfortunately I do not have a finish line photo for this race, apparently I was too quick to photograph. Haha. After I battled the crowd at the end of the finish chute I walked around a little and skipped the line to grab a banana when I spotted a friend. We sat in the grass talking while watching others finish and looking for her friend. It was a great start to a Thanksgiving and perfect weather for a race. Having a banana with Lisette after.